school work, it is the perfect fit. lovely fashion bloggers have out there. Let me know. Oh yes! And look forward soon to: Shop Flashes of Style! favorites). The shop will hopefully be up by the end of this week. i LOVE that sweater so much. it's adorable. trip to paris really sounds exciting! i'm sure you'll have a fabulous and enjoyable trip. huh! i really can;t wait myself to make a trip to paris with my family. 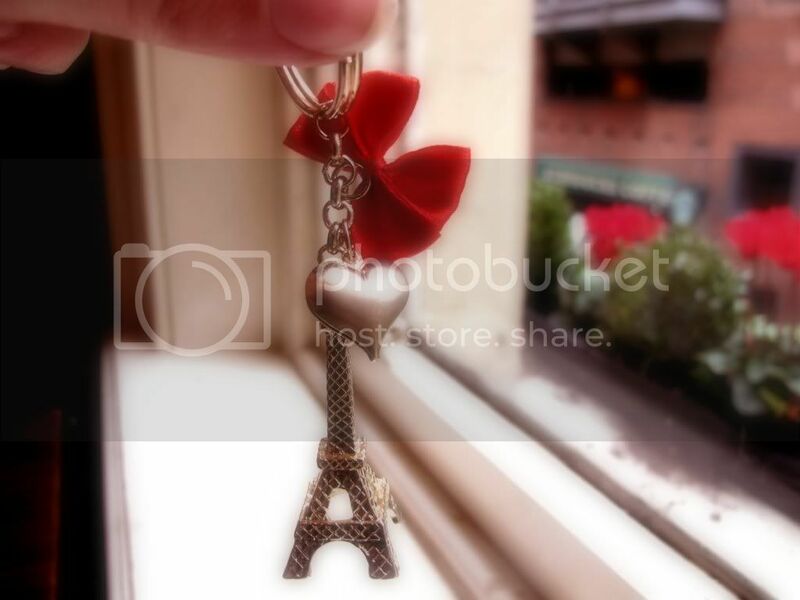 i love the eiffel tower key chain you got! i'm looking forward to see photos of you on your trip. i don't know about fashion hot spots, but you must go to musee d'orsay. art is everywhere, including van gough, and you can take pictures. also, the eiffel tower literally sparkles every half an hour so have your camera ready. and if you do not have time for the louvre, at least walk around outside of it. oh and versailles! it's AMAZING. just go. trust me. as for england, you have to go to hampton court palace. henry VIII had serious style. Great charm! I have got a Eiffer tower pin...luv! I've never been at Paris, but I'm sure that you'll love it! Your keychain is gorgeous... yaw! oooo i am so jealous you're going to paris! do eat a delicious crepe for me? Love that cute keychain...would make a great necklace! Super comfy outfits. I also like to wear things like that when you are not in the most glamorous mood. The key chain is so cute. I good way to remember you next trip to Paris. cute sweater. and i love your bag! You look adorable in that sweater and the keychain is so lovely! You can't go wrong with Paris, beauty is everywhere! I wanna go back so badly!! I love these images!! I love your tights!! paris now too??? ugh i am SO jealous. have fun girl!!! 3. Skip Les Halles. it's just a mall. 9. Make sure you check out the back/garden of the Notre Dame while you're there. the keychain and sweater are so cute!! so funny that you've run out of space...hehe. You are my go-to girl for the perfect sweater/dress combo! Love it so much! I just discovered your blog and I think Im already an addict ! if you like, you can visit mine but I'm too lazzy to translate my articles in english... whatever, the pics tell more ! Hey! I heart your style! seriously I found your blog while going through some other ones! I think you have great style chica! Well I'm new here and I'm dropping by all the blogs I follow to say Hello!! love the cardi! it looks so comfy! you are so shallow its gross. all you care about are your possessions. That's such a lovely cardigan, you look so pretty. ps. the anonymous commenter is obviously an idiot, I think that you are lovely. Adore your cardigan and your hair is so gorgeous !! Really love love your adorable keychain. And you're going to Paris ?! I wanna go toooo. I've never been there before. But I do know that going to the Effiel Tower is a must ! the sweater is sooo cute! Great outfit! You will love Paris, it's the most amazing city in the world! Don't forget to go to Colette! And you're gonna have a lovely time in Paris, it's really beautiful. Fantastic laid back look! Hope you are having a good time still. And you're going to Paris?! Oh joy of joys! When are going? Paris? Wow. What did you do to deserve that? Considering your style and your blog, I think you will love just walking around at le Marais. It's my favorite place, it's the old Paris (everything was rebuilt under Napoleon 3, you can see the new paris almost everywhere, but in le marais)(I always go walking there when I have free time between two classes). You can visit the museum of the city of Paris, which is very interresting. And you can enter any house which is open (it's basically the only place in France you can do it. And you should go walking at the Palais Royal/Louvre/Tuilerie because it's very impressive and very representative of what Paris is. love to see those colors together! That's such a cute outfit! Luckyyyy. You get to go to Paris. Can't wait for the opening of the shop, you have such cute clothes.